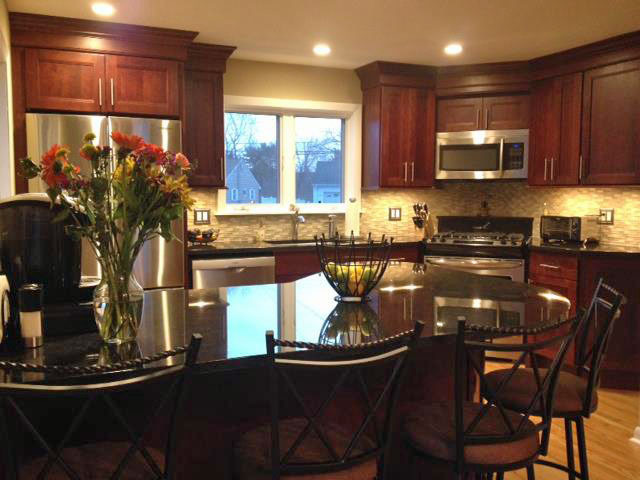 Dark cherry cabinetry and dark granite countertops always make for a classic look. This is a small kitchen and we had to be creative to maximize the wall space. Two problems existed: 1) the window could not be moved due to budget, and 2) a staircase to the right (not viewed) prevented us from placing the appliances on the right hand wall. To solve this, we decided to place the range in the corner of this kitchen. This created a very interesting look while also solving a very serious problem for this kitchen. Next we added a peninsula (seen in the foreground) that jutted out from the left wall. This defined the kitchen area from the adjacent room and added needed storage and preparation space.